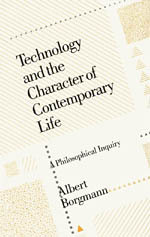 In this chapter, Borgmann explores what he calls the Foreground of technology. This is essentially the world of the use (i.e., consumption) of technological devices, rather than the world of their construction or operation. As we are all aware, technology results in a large set of commodities, and the “Foreground” is the world of their consumption. The Foreground is invoked, Borgmann says, when conversation turns to the topics of “leisure, consumption, or the standard of living” (48). The Device Paradigm is key to understanding the Foreground, since it explicitly describes the delineation between Foreground and Background through the distinction between a piece of technological machinery and the commodity that machinery is designed to produce. Interestingly, it is not just in “machines” that we see this pattern operating, but also in nature, culture, and other areas of human life. Wine, for example, has been slowly converted to a device, according to the definition of a device under the Device Paradigm. Rather than being something which is an unanalyzable whole, inseparable from its physical and cultural context, we now think of wine dualistically. One on hand it is the collection of chemicals which constitute its physical structure. On the other hand, it is a collection of color, odor, viscosity, and taste properties. What Borgmann claims is that because of the technological advances in winemaking, we are free to focus on one (the commodity, or foreground, of wine-stimuli) as consumers, while ignoring the other (the particular physical characteristics of the wine, which can be tweaked just so in order to provide the desired commodity). It used to be the case that a particular wine would “open up” a world—the world of its soil, its country, its experiences, etc…—but when features of wine are free to vary independent of context, that world is no longer opened up. We are experiencing the mere commodity, at that point, of a technological device. Borgmann points out that this state of affairs is not a result of modern science. As noted in a previous chapter, science renders physical phenomena clear and more knowable, but it does not by itself provide a pattern for action. The pattern which is responsible for the shift in our approach to wine is a result instead of the Device Paradigm. Of course, science is necessary for all of this to take place, but it is not the root cause of it. Borgmann sees the new situation with wine as an example of a general trend, that from a taste for ‘things’ to a taste for ‘commodities’. We are, essentially, focusing on the pleasing surface elements of things while disregarding everything else, which paves the way for those things to be replaced by devices. Another clear example is that of frozen meals—they are essentially aggregates of commodities, not things connected to specific places, people, seasons, times, and experiences, the way meals unavoidably were in pre-technological settings. Interestingly, they are presented to us as though they were connected in this way, which brings up a major aspect of the Foreground of technology, namely advertisement. It is such a part of our age that Daniel Boorsin has called it “the characteristic rhetoric of democracy” (52). Borgmann is careful to say that our consumer culture isn’t the effect of advertising, but the other way around: advertising is necessary for a consumer culture, and that in turn is simply the outworking of the promise of technology (i.e., consumption is the natural mode in an abundance of commodities). Borgmann quotes several authors who discuss precisely what advertising is, making interesting points along the way about the nature of commodities. Borgmann himself wants to be clear that what makes something a commodity is not a psychological fact (i.e., how a certain person approaches something like a TV dinner), but rather an ontological fact (i.e., the product’s construction and structure, or how it conforms to the Device Paradigm). What is philosophically remarkable and evident even now is that there is a widespread and easy acceptance of equivalence between commodities and things even where the experiential differences are palpable. People who have traveled through Glacier Park in an air-conditioned motor home, listening to soft background music and having a cup of coffee, would probably answer affirmatively and without qualification when asked if they knew the park, had been in the park, or had been through the park. Such people have not felt the wind of the mountains, have not smelled the pines, have not heard the red-tailed hawk, have not sensed the slopes in their legs and lungs, have not experienced the cycle of day and night in the wilderness. The experience has not been richer than one gained from a well-made film viewed in suburban Chicago. If the ends are all that matter, and if the ends result in equivalent mental states, then it will indeed be increasingly difficult to find any reason to have a “real” experience over a commoditized or simulated one. There are, Borgmann points out, counter-movements, among which he lists “voluntary simplicity”, “arts & crafts”, and, interestingly, “running” (which, when he wrote in 1984, was much less of a cultural fad than it is today!). Almost 30 years after he wrote, I think we can see even more clearly the distinction between these two types of movements, along with various interesting ways people have tried to combine them (e.g., the fascination with ‘local’ foods and products, but the simultaneous application of industrial, technological viewpoints to their growth and adoption via social media or other means). In the next chapter, we’ll take a step closer to the Background of technology and examine devices and machines more philosophically. was not always clear to me. I don’t believe that the lines Borgmann draws in this chapter are always natural. For example, the motorhome example is quite critical. Is driving the park really a correlate to a movie? I agree that it is not the same as hiking but because it (driving) is not one thing (hiking) does not immediately make it another (movie). The foreground/background distinction is very important and raises some great insights into how we view things and commodities. I do believe that as we foreground items, we can still see their background (see stereo example). But I think that Borgmann dismisses this a bit too quickly — there is a social structure that can and does reach to the background — maintains the more thing-ness of what may be a commodity. I believe we see this in OSS. That the structure of OSS is not just about commoditizing on non-differentiating technology. That the foregrounding of technology naturally comes with the communal aspect and the two can not be unwoven as simply as Borgmann leads me to believe. I agree with you about the trickiness of it. I have more of an intuitive than fully-explicable understanding of foreground/background. It just makes sense to me. Some things we don’t see because they are part of our explanatory framework, our way of seeing. We can change our depth of field and see it, but that’s not our primary way of being in the world, and the less we do this practice of changing our depth of field, the less we are able to do it in the future.